Behzad Yaghmaian provides some valuable insights in China: Empire Building in the Age of Globalization. "The United States helped China’s economic ascendance by promoting globalization and embracing, in recent years, a free market orthodoxy. In the annals of history, it will be noted that it was the United States itself that championed a new economic structure which ultimately undermined its own position in the world. Unencumbered by a free market orthodoxy, the Chinese opted for the opposite choice. They poured resources into areas pivotal for building a robust and competitive economy. China became the unintended winner of the limits of the United States’ free market ideology." Well, this is the short version of why America has allowed such an enormous balance of payments with China. In real terms, this recipe for economic demise was designed by the transnational corporatists. The intentional encouragement and approval of de-industrializing America has been no accident. The systematic dismantling of the merchantry economy followed as plant and equipment manufacturing moved offshore in order to build the Chinese coolie export dynasty. This trade and industry structure was planned as a global warfare assault to bankrupt the American economy. The way back to a viable merchantry is to defeat the 21th Century robber barons who are most vulnerable to any significant drop in their exports. China has proven they are threats to any rational receptacle trading partnership. Alan Tonelson in All of the Reasons Why Trump Can Win a Trade War With China, clearly lays out why China is a distrusted actor and major reasons they will lose far more from a curtailing of their overseas sales into the United States. "Would a country that could take or leave its trade surpluses work so hard to extort or steal its rivals’ intellectual property? Would it pursue industrial policies aimed precisely at creating advantages for so many designated key sectors of its economy over foreign competitors? Would it limit exports of critical commodities like rare earths (essential for electronics and information technology manufacturing) to give its own producers a leg up on rivals press non-Chinese companies to move operations to the PRC? Would it subsidize massive overcapacity in goods like steel and aluminum in order to undercut the competition globally? Would it place so many restrictions on foreign providers of farm products along with banking, insurance, telecommunications, Internet-related, audiovisual, express delivery, legal and other services? Would it sue its trade partners in the World Trade Organization simply because they’re exercising their right to bring actions against China? Would it remain so determined to keep foreign firms in the dark concerning the regulations concerning licensing and operating requirements; product, investment, and business expansion approvals; and business license renewals? One of these benefits has to do with achieving a goal that’s become imperative to the Chinese authorities—improving the quality of Chinese growth. As with America, too much of China’s economic expansion depends on ever higher levels of debt, rather than on more sustainable sources of demand. And Beijing at least sounds determined to rein in its unregulated shadow banking firms—particularly important lending culprits that have showered credit on provincial governments anxious to meet politically rewarding growth targets." In order to forge a worldwide economic alliance, Trump Is Building An Army Of Nations In Trade War Against China. Only President Trump has the guts to put the Chinese State-Owned Assets Supervision and Administration Commission of the ruling State Council (SASAC) business enterprises in the target sights to reign in their predatory practices. "Earlier on Thursday Larry Kudlow confirmed that Trump is indeed building an army ahead of the big showdown with China. According to Bloomberg, Kudlow wants to rally "pro-market allies to push back against China’s unfair trade practices," a senior White House adviser said. In threatening to punish China for its abuse of intellectual property, Trump is “doing what everyone in the world has said we should do,” said Kudlow, adding that the administration will have more to say about its efforts to recruit other major economies to support the U.S. position." 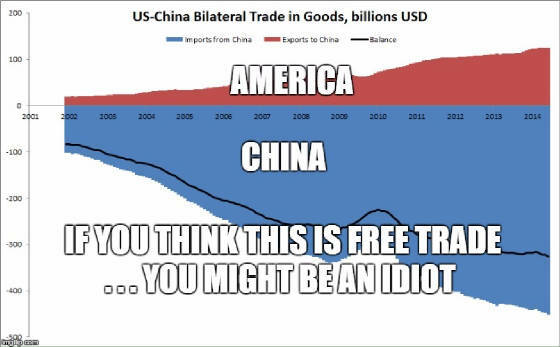 America has been pillaged by China for decades. Much of the rest of the world has also been abused by their same theft methods. Fear that China will strike back ignores the fact that China cannot afford missing out selling to the U.S. consumer. Americans gain the opportunity to defeat this aggressor by becoming independent of Chinese export dependency. The United States can win this trade war, it is time to get serious.